LTE-Advanced, standardized in 3GPP Release 10, will enhance LTE into a true 4G mobile communications technology while meeting the IMT-Advanced requirements in terms of peak data rate and spectral efficiency. Carrier aggregation is the most demanded feature of the LTE-Advanced feature set because it will allow network operators worldwide to aggregate their different spectrum holdings. 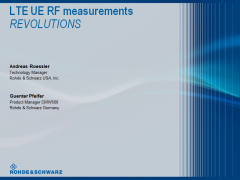 In the third part of the Rohde & Schwarz webinar series on LTE UE RF measurements, we will discuss the details of carrier aggregation, its different types and its impact on how to test a device that supports carrier aggregation. Emphasis will be on receiver testing using the R&S®CMW500 wideband radio communication tester.